put a large range of well-selected hands through this to check for edge cases. integrate this whole screen with the hand replayer window, so that you can easily go forwards and backwards through these hands. make it simple to copy and paste this into a format suitable for poker forums. 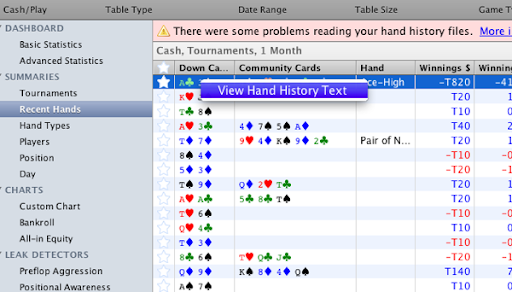 When you right-click (or ctrl-click) on a hand in Poker Copilot’s “Recent Hands” Summary, you can “View Hand History Text”. Clearly I can offer multiple formats. But I like to start simple. Oh dear. It seems Poker Tracker is changing how they calculate the “Voluntarily Put Money in the Pot” (VPIP) in a future update. This is problematic for me. Because it ensures I’ll get a flood of support emails asking why Poker Copilot’s value for VPIP doesn’t match Poker Tracker’s value. I must admit, though, that there is logic in their change. The current update of Poker Copilot no longer has the obsolete options to add PokerStars tournament summaries manually. For a few months PokerStars can give Poker Copilot these files automatically. If you were using one of the older ways, such as letting Poker Copilot scan your Gmail, or manually adding the files into Poker Copilot, you should now enable “Tournament Summaries” in PokerStars. Poker Copilot 2.93 is now available to download. 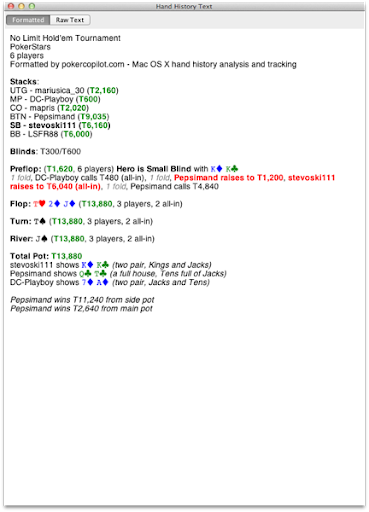 Added support for Hero Poker. Merge Network limit hold’em hands were not responding correctly to the “Advanced” -> “Stake Level” Filter. There are also some performance and reliability tweaks. I’ve been unusually quiet on the Poker Copilot blog lately. That’s because I’ve been getting the most out of my Central American holiday. I’ve changed the way unexpected crashes or power outages are handled. This means that the problems in recent versions with crashes and corrupt databases should be much less. There are some other small tweaks and fixes which I’ll list when I release the update early next week. I just played a couple of tournaments and noticed that my MacBook Pro was getting extremely hot. It seems Poker Copilot was maxing out the CPU. I want to investigate what’s causing this once I’m back in my full office in Germany.